No one knows wether the story’s true, but it is a good one anyway. Ernest Hemingway was sitting having a drink with some writer friends at Luchow’s restaurant in New York. They were taking about this and that, and eventually moved on to what the ideal length of a good novel might be. 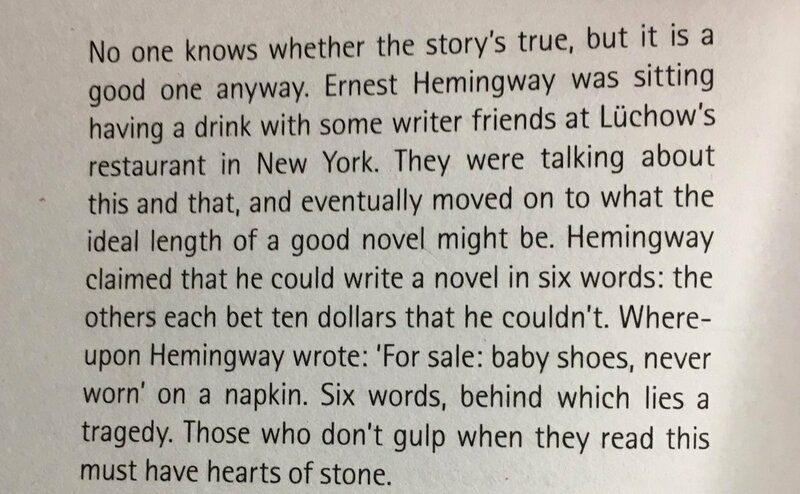 Hemingway claimed that he could write a novel in six words: the others each bet ten dollars that he couldn’t. Whereupon Hemingway wrote: “For sale: baby shoes, never worn” on a napkin. Six words, behind which lies a tragedy. Those who don’t gulp when they read this must have hearts of stone.